Depth-image-based rendering (DIBR) is widely used in 3DTV, free-viewpoint video, and interactive 3D graphics applications. Typically, synthetic images generated by DIBR-based systems incorporate various distortions, particularly geometric distortions induced by object dis-occlusion. Ensuring the quality of synthetic images is critical to maintaining adequate system service. 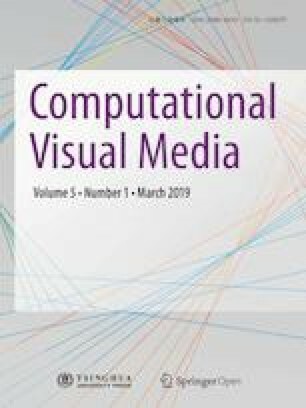 However, traditional 2D image quality metrics are ineffective for evaluating synthetic images as they are not sensitive to geometric distortion. In this paper, we propose a novel no-reference image quality assessment method for synthetic images based on convolutional neural networks, introducing local image saliency as prediction weights. Due to the lack of existing training data, we construct a new DIBR synthetic image dataset as part of our contribution. Experiments were conducted on both the public benchmark IRCCyN/IVC DIBR image dataset and our own dataset. Results demonstrate that our proposed metric outperforms traditional 2D image quality metrics and state-of-the-art DIBR-related metrics. Xiaochuan Wang received his M.Sc. degree from Beihang University, Beijing, China, in 2012. He is currently pursuing his Ph.D. degree in the State Key Laboratory of Virtual Reality Technology and System, Beihang University, China. His current research interests include mobile graphics, remote rendering, image quality assessment, and multiview video systems. Xiaohui Liang received his Ph.D. degree in computer science and engineering from Beihang University in 2002. He is currently a professor in the State Key Laboratory of Virtual Reality Technology and System, Beihang University. His research interests include computer graphics, animation, visualization, and virtual reality. Bailin Yang received his Ph.D. degree in the Department of Computer Science from Zhejiang University in 2007. He is currently a professor in the Department of Computer and Electronic Engineering of Zhejiang Gongshang University. His research interests are in mobile graphics, real-time rendering, and mobile games. Frederick W. B. Li received his Ph.D. degree in computer science from City University of Hong Kong in 2001. He is currently an assistant professor at Durham University, UK. Before that, he was an assistant professor in Hong Kong Polytechnic University and project manager of a Hong Kong Government Innovation and Technology Fund (ITF) project. His research interests include distributed virtual environments, computer graphics, and e-learning systems. Dr. Li has served as a guest editor of special issues of the International Journal of Distance Education Technologies and the Journal of Multimedia. He has served on conference committees of a number of conferences, including as Program Co-Chair of ICWL 2007-08, 2013, 2015, and IDET 2008-09, and Workshop Co-Chair of ICWL 2009 and U-Media 2009. The authors would like to thank the anonymous reviewers for their valuable comments. They would also thank Kai Wang and Jialei Li for their assistance in dataset construction and public release. The work was sponsored by the National Key R&D Program of China (No. 2017YFB1002702), and the National Natural Science Foundation of China (Nos. 61572058, 61472363).